Stobart Air could be facing disruption after cabin crew employed directly by the airline in Ireland voted unanimously for industrial action. The ballot centred around the non-unionised company's refusal to recognise the Fórsa union and negotiate with the union on staff pay and working conditions. Fórsa says it represents around 130 directly employed cabin crew personnel who are based in Dublin and Cork. 84% of the ballot papers were returned by the time the poll closed earlier today, with 100% of those who took part in the vote backing the industrial action. 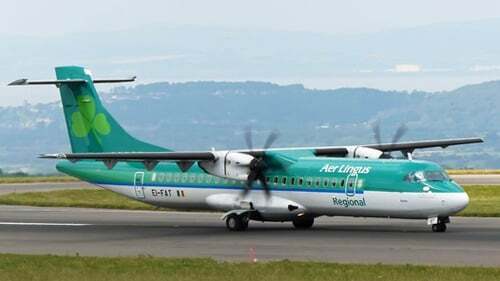 Stobart Air operates Aer Lingus Regional services. A recent pay proposal made by the company was rejected by two thirds of cabin crew who voted, according to Fórsa, as it "fell short of" airline industry norms. According to Fórsa, it also referred the dispute to the Workplace Relations Commission, but an invitation to talks that followed was refused by the company. "Management's refusal to do business in the usual way has left its staff feeling they have no choice but to consider industrial action," said Fórsa official Ashley Connolly. "The ballot gives the union a legal mandate for industrial action if the company takes disciplinary action against any crew member because they have joined the union, or because they participate in an industrial dispute," she said. The union says staff support for it to negotiate on their behalf was overwhelming and the disputes committee will now consider its next steps. "We are aware of reports of a ballot result today and have yet to receive any formal correspondence in respect of this ballot," said a spokesperson for Stobart Air.